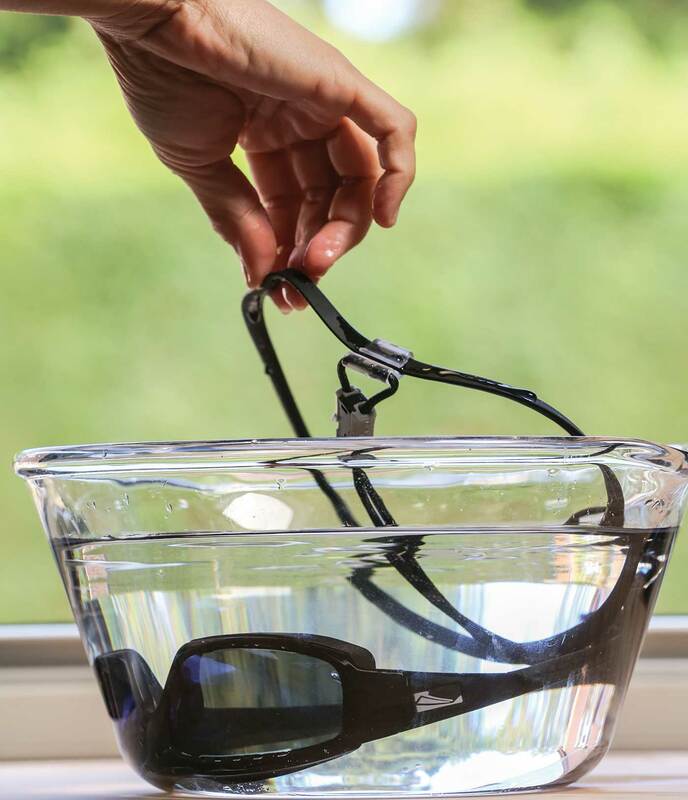 With the leash and necklace still attached, run them under a freshwater tap for a few seconds, but don’t touch the lenses at this stage. Next, place them gently into a bowl of lukewarm fresh water with the temples a quarter closed and leave them there to soak for 10-15 mins. This will give time for any hardened salt residue to fully dissolve. Take them out of the bowl and run them again under the freshwater tap. Leave to dry in the shade / hang them out of harm’s way. When dry, inspect the lenses in particular to make sure there is no salt residue, especially at the junction of the lens and frame. If there is no salt / dirt residue remaining on the lenses, buff them with the microfibre bag supplied. ONLY use the microfibre bag supplied. Other materials could be abrasive. From time to time you can use some soap to clean the lenses and frames. We recommend doing this fairly regularly if you are using strong sunscreens. Make sure the soap is chemical free and non-abrasive, and make sure your hands are clean too. Between steps 2 & 3 above, place a few diluted drops of soap onto the lenses, the rubber nosepad and rubber temples, and with your clean hands gently work the soap on both sides of the lenses and the rubber parts. Be sure to clean the area where the edge of the lenses meet the frame, where salt, dirt, skin oils and sunscreen can accumulate. Dedicating a little time to rinsing salt and dirt off your watershades after a session, just as you would do with your clothing and equipment should guarantee that you have an enduring relationship with your sunglasses.